More languages are spoken in Papua New Guinea than in any other country on Earth – an estimated 800 different languages. Traditional languages may be limited to a small group or spread across a large geographic area. To facilitate communication between different language groups, the country has adopted three languages as the official languages of government. These are English, Tok Pisin and Hiri Motu. 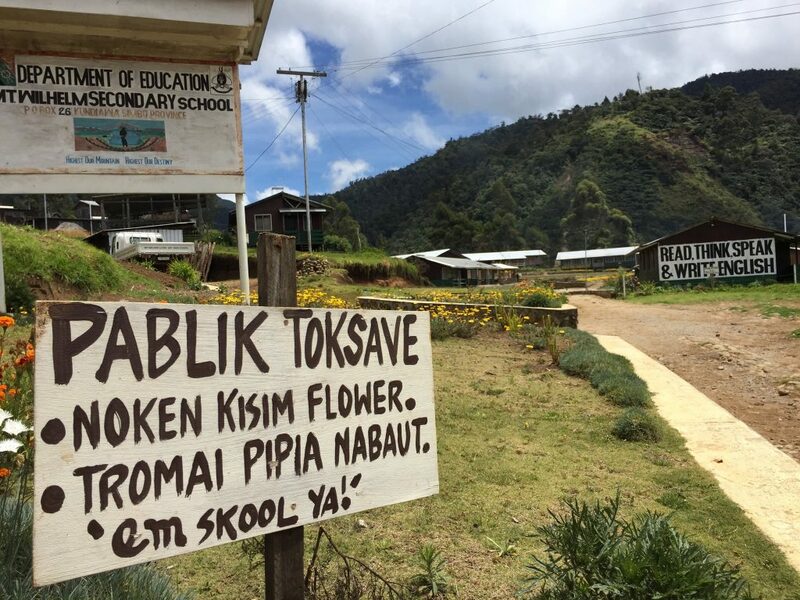 Tok Pisin, literally ‘pidgin language’, is one of three official languages of Papua New Guinea, and in a country where more than 800 languages are spoken has become the most widely spoken language ni the country. It is spoken and understood by an estimated three quarters of the country. The language takes much of its grammar and vocabulary from English, with a number of words also adopted from German, and to a smaller extent from dominant traditional language groups. There are few formal training programs in Tok Pisin, but there are a number of online resources to help the first-time speaker to gain proficiency. James Cook University maintains online pages with copies of a Tok Pisin language course developed the Australian National Unversity in the 1970s and 80s. Documentation and audio files are available to help the learning speaker. The Australian National University will offer studies in Tok Pisin through its College of Asia and the Pacific from 2019. The ABC’s Radio Australia broadcasts news and information programming in Tok Pisin and maintains an online page with both written and audio resources. Papua New Guinea broadcaster EMTV publishes its tok pisin news broadcasts online. Hiri Motu is a simplified version of the Motuan language used between different language groups along the Southern coast of PNG. It was adopted and used by colonial authorities in the region and became a popular lingua franca throughout the Australian administered territory of Papua. Its usage has declined in recent years in favour of Tok Pisin and English, but Motuan languages are still dominant in the Central and Gulf Provinces that surround Port Moresby. Hiri Motu is one of the three official languages of PNG.